Purple Co offers impartial and robust assessments for Life Insurers and Legal Services Teams to assist in sound decision making. Our assessments help claims assessors, case managers and legal professionals make sense of their client’s functional restrictions, their capacity for employment and, where appropriate, apply their capacity to their local labour market. Purple Co assessments are useful at many stages of the claims and rehabilitation process. Employability Assessment allows for the analysis of work capacity. It provides evidence of current employability in the open, real world labour market. Our assessments will also source rates of pay from a variety of sources including award structures and market sources where required. Employability assessments can include an interview with the client where necessary, or be conducted in a “paper-based” or “desktop” style. Review of functional capabilities, whether they are physical, psychological, and sensory or illness related. Analysis of the skills the claimant possesses that are transferable to new employment. Demographic indicators for labour force participation. Analysis of actual labour market opportunities matched to transferrable skills. Assessment of earning capacity is required. 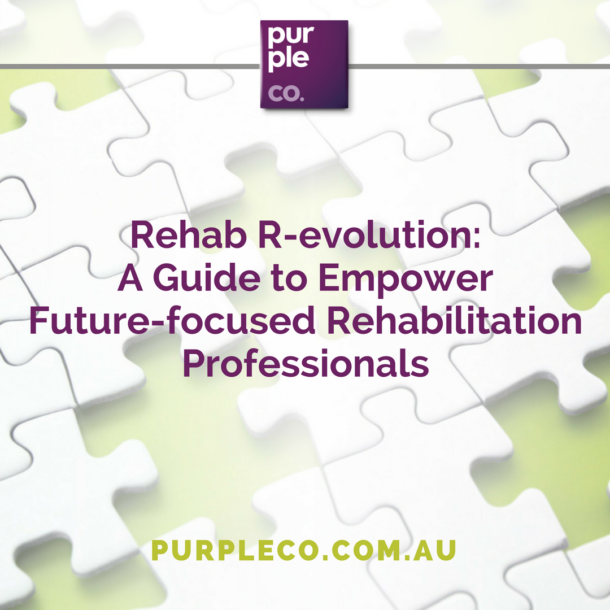 Purple Co understands the importance of relevant, timely and comprehensive information from claimants to assist in both rehabilitation planning and also claims risk assessment. Our experienced consultants are adept at using the initial interview process to identify the barriers, fears, secondary gain issues that may present in the beginning of a claims process. Our ability to identify these issues quickly facilitates the timely implementation of a plan to address these issues quickly. Our expertise also affords us the ability to use a wide range of community based treatment providers and networks to facilitate recovery where medical management is a primary barrier to returning to paid employment. When you require comprehensive analysis of the mechanism of disability; the progress of treatment; barriers to potential employment participation; or medical and allied health treatment provider prognosis. Where an in-depth assessment is required without the need for ongoing service provision expected. Where conflicting information requires clarification during the claims assessment process. The TSA is an integral component to the vocational decision making process. Individuals, who present with a well-developed occupational skill-set and a solid understanding of their limitations and opportunities, may benefit from a TSA to identify the range of occupational opportunities that exist for them in the job market. The TSA is an analysis of skills transferable to alternative employment, and as such does not include any occupational, basic skills or aptitude testing. When identification of skills relevant to the current labour market is required. When a labour market analysis is required and there is no pre-existing vocational information. In the provision of vocational counselling to facilitate vocational decision making with a client. For the accurate and relevant development of a Linkedin Profile, resume and online job search documentation. In Labour Market Assessments (LMA), we analyse a client’s labour market, job market and demographic impact upon their potential vocational options. The LMA provides an indication of the likelihood of an individual being able to access a given occupation in their local area. It also provides scope to analyse potential earnings for a specific occupation. Purple Co LMAs do not rely solely on database data. We spend time talking to industry and analysing trends to ensure that occupations are not only physically and psychologically appropriate, but also a direct match for transferable skills. Through our proven LMA techniques, we are able to tap into labour force knowledge where there is sector growth, and we have become experts in being able to identify how a person’s skillset can transfer into the marketplace. Application of LMA data can be used to support applications for retraining, review previously identified vocational goals and to provide updated post-injury earning information. Our LMA methodology has been successfully used in a range of employability assessments and as a project specific assessment to the Wholesale TPD market. We can carry out an LMA for a “paper based” assessment as well as where interviewing the claimant has been required. When a “paper based” analysis of occupational data is required. When a review of previously identified vocational options is required in relation to labour market relevance and opportunities. When conflicting information exists between other LMA sources and the “real world”. Where a tighter more clinically robust assessment of claimant’s ability to access employment is required. Where “evidence” is required to support employability for a claimant. Assessment of pre-disability job demands can be critical to the development of an effective rehab and claims strategy. Our workplace assessments and task analyses include onsite observation and analysis of the physical task requirements of an occupation, or can be used in conjunction with a labour market style of analysis where we can contact a variety of employers to determine the key tasks and physical demands of a specific role. Objective analysis of pre disability job demands from physical, sensory and psycho social perspective is required. Objective information to provide to treating medical and health practitioners. Objective basis is required for discussion with a claims assessors/CMO regarding the claimant’s ability to perform a role or components of a role. More effective job matching is required. More effective application of physical diagnostic information to functional task performance is required. When the physical, sensory and psycho social demands of an occupation are unclear. To assist with the investigative process at the beginning of a claim or re initiation of a claim. When objective functional data in relation to job task performance is required to facilitate an informed medical opinion. Where previous return to work intervention has failed. Where a diagnosed condition is known to include periods of symptoms exacerbation or deterioration. Where the identification of job tasks and the need for occupational re-engineering is required for a person experiencing a deteriorating disability such as MS, CP, CFS or other types of degenerative conditions where deterioration in function can be medically anticipated. Where psycho social barriers appear to be more significant barriers than previously experienced. Where the need for more comprehensive, updated treatment and prognostic information is required. When an in-depth assessment is required without the need for ongoing service provision expected. Ready to enquire about working with us?